Depending upon the injury that you have sustained, there are a number of different benefits for which you may qualify. 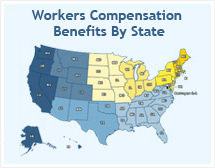 States have small differences regarding the specific benefits offered through their workers' compensation programs, however, the following is an outline of benefits available through most workers' compensation programs. Temporary Total Disability (TTD) is a benefit paid until you are able to return to work. It is paid to you during the period that you are totally disabled. Once you have medically recovered and are no longer disabled, this payment ceases. Temporary Partial Disability (TPD) is a benefit that is paid to you while you are partially disabled. If, for example, you are able to return to work on a part-time basis, but cannot work full time due to your disability or continuing rehabilitation, you will receive a TPD payment. This will be a portion of the full amount of your weekly gross earnings. Permanent Partial Impairment (PPI) is a payment that is made in addition to your temporary disability benefits. Your doctor may determine that you are medically recovered, however, you may have some permanent physical loss (such as amputation or loss of use of a body part). This payment is based on the percentage of loss determined by your doctor and then a rate is determined based on the estimated amount of lost wages. This payment can be made in a lump sum or in increments depending on the laws in your state of residence. Permanent Total Disability (PTD) is a benefit that is paid to you if your injury has disabled you in such a way that you are no longer able to earn a regular income. PTD is determined based upon the nature of injury, degree of physical impairment, age, education, work history, and the injured worker's ability to be retrained and the availability of suitable work in the geographic area of the worker's residence. PTD benefits are paid until death. Death Benefits: In the case of a work related death, the insurer will pay for a portion of funeral expenses and a payment to the employee's surviving spouse and dependents. The amount of these payments varies depending on your state of residence. In addition to these payments, weekly payments will also be made to the employee's dependents at the PTD rate for a certain amount of time depending on the status of the survivor. Medical Benefits: Providers of workers' compensation insurance are obligated to pay for medical expenses. Insurers usually pay for all medical care until the injured worker has recovered from the injury. Reemployment Benefits: This is a benefit that is paid to the injured worker incrementally or in a lump sum to either retrain for a new occupation or as a "job dislocation" compensatory payment. If you have any questions about case, or if the compensation you have been offered is inadequate or seems unfair, please contact us right away.